1. 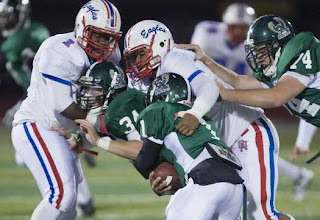 James Franklin, running back, Olathe North: Free State's defense was developing a stingy nickname until Franklin came to town. His made his 287 rushing yards and four touchdowns look easy in his team's victory. He has now rushed for 1,3469 yards (224.3 ypg) and 18 touchdowns on the season. At this rate he will break Darren Sproles' career rushing record at Olathe North by season's end. 2. DJ Balazs, quarterback, SM West: Balazs had another solid game passing for 99 yards and and one touchdown. He is now just two wins short of 20 career wins as a starting quarterback, a number many great quarterbacks in the league have fallen short of. 3. Camren Torneden, quarterback, Lawrence Free State: Torneden (below) completed nine of 19 passes for 97 yards and two touchdowns on Friday, but on the ground (the area where he usually makes the biggest impact) he was held to just 20 yards. Torneden drops one spot, but could easily jump back to #2 next week with a good game. 4. Brandon Willingham, running back, Olathe East: Against Leavenworth Willingham received limited playing time to reduce the chance of injury, and to give other players more reps. Regardless, he still rushed for 80 yards and a touchdown, and recorded nine tackles on defense. 5. 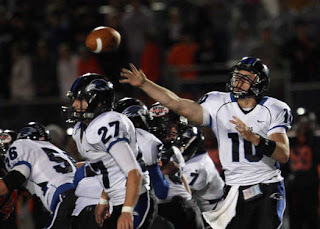 Matt Nowak, quarterback, SM Northwest: Nowak bumped himself back into the Top Five Ratings with a stellar bounce back game against Olathe Northwest. Nowak rushed the ball eight times for 23 yards and a touchdown, in addition to completing six of nine passes for 93 yards and a touchdown. He also successfully booted two field goal attempts. *Power Rankings are subject to change on a week-to-week basis.